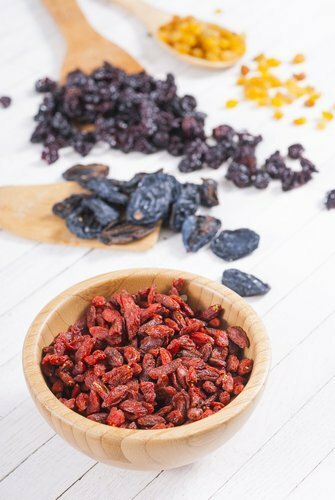 There are many benefits to drying fruit at home: it’s cheaper than buying dried fruit at the supermarket, lasts almost 10 months in the pantry, tastes delicious, and is a really great way to make use of your overripe fruit! Assuming you have a plethora of overripe fruit, here’s how to dehydrate fruit right in your oven! Each fruit varies in time and prep, but the general down-low on how to dry fruit in the oven basically revolves around making sure the oven remains on a low heat during the drying process–this means about 160 degrees fahrenheit. Drying fruit could take up to 10 hours or longer, so before you get started, make sure that you will have the time to hang around the kitchen, or at least check on the oven every few hours. Prep your fruit. Wash in cold water, peel and remove any blemishes/bruises from the fruits you will be using. Make sure to remove any unwanted stems, seeds and pits from your fruits. Cut and slice the fruit evenly, as to make sure they all dry at the same time. Soak your fruit. To ensure that your fruits don’t lose color or their natural beauty, soak your sliced fruit for about 10 minutes in a mixture of water and a few teaspoons of lemon juice. This will prevent your fruit from turning brown and will keep it this way throughout the drying process. Prep oven and set fruit in! Preheat your oven to its lowest heat setting–stay in the range of 130-200 degrees fahrenheit (the lower the better for even, chewy texture). Berries do better in higher heat, whereas thinly sliced apples would do better in lower heat–something to keep in mind when setting the temperature and time. Place parchment paper onto sheet pans. Arrange fruit in a single layer, and do not allow pieces to touch. Top fruit with a silicone pan liner to keep them from curling up as they dry. Place fruit into the oven and rotate pans every 2 hours. Cure your fruit. When the fruit is ready, remove it from the oven and place in glass or plastic containers to “cure.” Leave the container open for 4-5 days so that any moisture left from the drying process can evaporate. Shake the container every day or so to move the fruit around. Seal the containers after 5 days and enjoy dried fruits until next harvest season, or about 10 months. Keep these trips to dehydrate fruit in mind as you look to store your summer fruits before the warmer weather ends! This entry was posted in Articles, Health Tips, Vegan Lifestyle and tagged dehydrated fruit, fruit, Health Tips, healthy, how to dehydrate fruit, Naturade Total Soy, naturadelife.